I've read some articles about that poem. All of them (for instance, this one) say that mimsy is an adjective, but they don't say why. I can't make head nor tail of the syntax of this sentence. So, is the form of using an adjective in the example above really correct? And why it can't be a noun (i.e. like in all wolves were the animals)? I really can't understand it. All priests were the granters of indulgences. All rosy were the cheeks of the children. In ordinary prose, we'd say "the soldiers were brave". To decide, consider the following common&ast; English adjectives, most‡ of which are formed by adding the suffix -y to the related noun ending in s/se to get an adjectival form: ease->easy, nose->nosy, etc. All autopsies were performed by the coroner. All fantasies were repressed by the patients. Given the distribution favoring adjectives of words ending in -sy, the lexical likelihood of finding a related noun, the syntactic constraints on number, and the fact that this is a poem, where the subject/adjectival-complement order may be inverted, a fluent English speaker will consider that mimsy is an adjective meaning having the qualities of a mim, some noun unknown. &ast;I obtained my list here. Since I edited the results, and I'm going to argue by weight of vocabulary, I need to reveal my method. I avoided double counting by excluding some words formed by prefixing (e.g., aacatalepsy, discourtesy, nondrowsy, overbusy, rebiopsy, ultraglossy, uneasy). &ast;&ast;I eliminated technical (mostly medical) terms (biorhexistasy, cholecystolithotripsy, cholelithotripsy, dyschromatopsy, glacioisostasy, hemiachromatopsy, hemichromatopsy, hypnolepsy, lithotripsy, nephrolithotripsy). 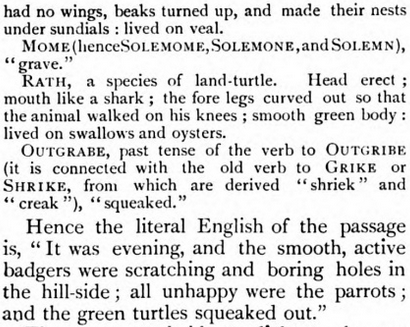 ‡ Those not related to common nouns are noted in the numbered notes, the content of which is from the OED. Those which have no known candidates for related nouns are in bold italic. clumsy probably from the now-obsolete clumse, eventually from a Scandinavian word meaning to benumb with cold. It had a number of pejorative uses as an adjective and an attributive noun. flimsy Derivation uncertain. The claim of film seems like folk etymology, especially given the adjective filmy. But the word flim is preserved as a fossil in flim-flam, and it’s possibly related to an Old Norse word flim meaning a mockery or lampoon. Later in the book, Humpty Dumpty gives Alice an explanation of the odd words in the poem and he defines 'mimsy' as 'miserable and flimsy'. In other words, we know it is an adjective because Lewis Carroll intended it to be one. Prim; careful; affected; feeble, weak, lightweight. Apparently < MIM adj. + -sy (in CLUMSY adj., FLIMSY adj., TIPSY adj., etc.). Compare MIMSY adj.1, by which this word appears sometimes to be influenced. Reserved or restrained in manner or behaviour, esp. in a contrived or priggish way; affectedly modest, demure; primly silent, quiet; affectedly moderate or abstemious in diet (rare). Also (occas.) of a person's appearance. Exactly so. Well, then, "mimsy" is "flimsy and miserable" (there's another portmanteau for you). The portmanteau clearly amounts to something akin to 'unhappy', but if there was any doubt, that meaning is made explicit in Carroll's gloss of the first verse of "Jabberwocky", first published in Carroll's own literary magazine, Mischmasch, in 1855. The evidence from the 1855 Mischmasch, along with the evidence given by Humpty Dumpty in the 1871 Through the Looking Glass, leaves no doubt that 'mimsy' is an adjective. Without that evidence, 'mimsy' could well be a noun, verb or even a subdued interjection in poetic use. all ready/all set (meaning "fully prepared", e.g. "Toby, are you all ready for school?" So, "the bogoroves were all mimsy" comes across as meaning "the bogoroves were thoroughly mimsy". Certainly, this is the construction that makes the most sense to a native ear. The poem is a pastiche of heroic poetry such as Beowulf. This inversion is generally seen by native English speakers as old-fashioned/archaic. 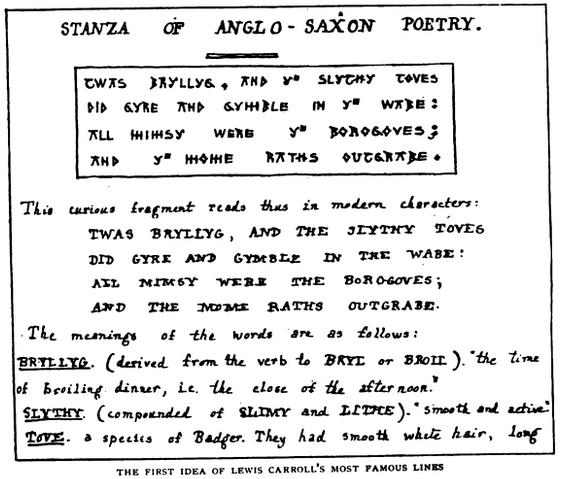 There are many other archaic constructions in the poem too - just in that first verse, "twas midnight" and "the slithy toves did gyre" are forms which were no longer in use in spoken English at the time Carroll wrote it. *Henry thought that all mimsy were the borogoves. Henry thought that the borogoves were all mimsy. The borogoves were all mimsy. The borogoves were all mimsies. "Mimsy" must be an adjective, since it doesn't agree in number with the subject. It's an example of poetic inversion. "The borogroves were all mimsy" wouldn't trouble you. Mimsy is an attribute of the borogroves. Writing it backwards makes no difference. "The sky was blue" "Blue was the sky". Poets (and Yoda) like doing that sort of thing. Not the answer you're looking for? Browse other questions tagged adjectives syntax parts-of-speech or ask your own question. Awkward style choice or syntax error? Why “No smoking” works but “Yes smoking” doesn't? What grammatical role “proper” (and related) plays postpositionally?